Frank Beresford was born in Derby in 1881 and trained at the Derby School of Art (1895-1900), the Académie Carmen (Paris), St John's Wood Art Schools (1900-1901) and the Royal Academy Schools (1901-1906). Between 1906 and 1908, Beresford was elected to a British Institution Scholarship and embarked on a 30,000 mile, 18-month-long international painting tour, during which he attended the Meiji Emperor’s annual tea party in Tokyo. Before the Great War, Beresford also designed murals for St Bartholomew the Great Church, Smithfield and received an art award from the Japanese Government (1909). In the Great War of 1914-1918, Beresford joined the London Regiment and served as an instructor, rising to the rank of Sergeant Major. A regular exhibitor at the Royal Academy, he was an early member of the United Society of Artists (founded 1921) and of the New Society of Artists. His popular oil canvas portraits, painted in his St John’s Wood studios, resulted in a career spanning six decades. A natural salesman, he received over 3,000 individual commissions from royalty, aristocracy, ex-civic leaders and politicians, senior army officers, society figures, celebrities and industrialists. His many oil paintings of historical events included the famous: The Princes' Vigil: 12.15am, January 28 1936, (1936), depicting George V lying in state in Westminster Hall. Exhibited to great acclaim at the Royal Academy, the picture – which took Beresford 37 hours to paint at the scene - was later bought by his widow, Queen Mary. In the inter-war years, Beresford also specialised in interiors, animals, landscapes, aircraft and murals. He was married to artist Daisy Radcliffe Clague until her death in 1939. 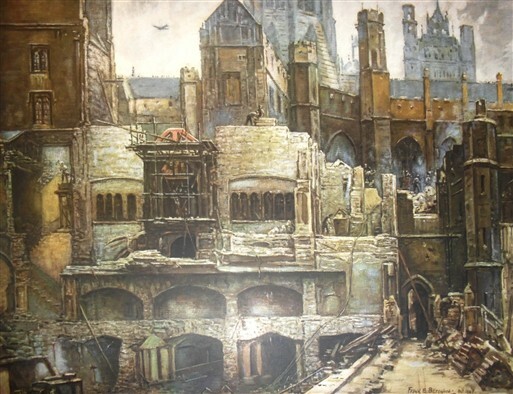 During the Second World War, Frank Beresford served as an instructor in the Home Guard and as an official war artist for the Royal Air Force (RAF). He was also accredited to the United States Army and United States Army Air Force (USAAF). For three years, he painted and sketched on air stations across Britain (often rising at dawn to paint military aircraft) including depictions of RAF, USAAF, Dutch and Polish air crews. At the end of the war, he received an Exceptional Service Award from the USAAF. His many wartime commissions included the Demolition of the Blitzed House of Commons (1945), a powerful rendering of the remains of the House of Commons Chamber destroyed by enemy action on 10-11 May 1941 and Deep Effort to Regensburg (1943) a depiction of US B-17 bombers flying over the Alps. With his pre-war reputation as a royal painter, Beresford was subsequently commissioned to paint the lying in state of George VI (1952) and Queen Mary (1953), although the Royal Academy declined to exhibit them. He also painted The Morning Ride, featuring Princesses Elizabeth and Margaret. In 1949, he was married for the second time to Beres Evelyn Pym, producing two daughters. Beresford was an extremely well-travelled artist, including a 14-month painting tour to South Africa (where he painted General Jan Smuts) and of Rhodesia. An account of his life was written in 2008 by biographer John Fineran: ‘Frank E. Beresford: Indomitable Self Belief 1881-1967’. Frank Beresford died at the age of 86 in 1967. I have a small print of Trafalgar Square, taken at 3pm V.E.day in the Heart of the Empire. It is signed by Beresford--"to Colonel R.W.Frost;with compliments from the artist Frank E. Beresford London June 8th. 1946". The print is done all in pencil on a grey border,and is a bit torn. Any interest? I own "Berlin Tourist 1941 Style - Non-Stop Return" by Frank E. Beresford. A painting of a crew member in the Polish Bomb Sq. at RAF Station Hemswell and passed by the Air Ministry censor on December 16, 1941. I'm trying to gather information on this man for a Wikipedia article to go with his paintings in Derby Museum. Any help appreciated. The draft is on wikipedia. If Roger Bamkin would like to contact me, I can give him some information about Frank Beresford who was a friend of my Grandmother when they were young. I have a portrait of her painted and signed by him, along with correspondance. I have just inhereted a lovely print of the "Demolition of the Blitzed House of Commons" There is a note on it to my grandparents, Prebble and Dora Rayner in Frank Beresfords hand writing and it is signed and dated by him. Grandfather was an artist, art critic and journalist in London until he emigrated to South Africa in 1939. They must have been friends and contempories. The print is dated 1948 so he must have been visiting Cape Town and met with my Grandparents and given them the print. I have a very fine oil painting signed by Beresford & dated 1949. The subject is the Rhodes Memorial on Table Mountain. Regarding my previous comment, the date of the painting is 1947. It was shown at the Park Lane Exhibition 13th Jan- 15th Feb 1949. Catalogue number 14. I love this piece. The collector I work for is actually in possession of the original painting. He's trying to sell it though. i have a work ,in ink by frank e bursford, of an aeroplane called the spirit of vega,dated 25.08 1941. could you tell me what I should do ,with this, with regard selling it. I have a print of the "Princes' Vigil 12:25am 1936 signed by him and dated 1944 in frame with his name and all in the print framed in England, it was my grandmother's what can you tell me about this? In the early part of WW2, my Uncle was in the RAF and was asked if he would stand in to have a painting done of King George the VI because the King was not well enough to stand for a long period of time. The artist painted Charles Norman McVeigh in the King's military uniform, then just painted the King's face in. For doing this my Uncle had an oil done of himself by the same artist and it will soon be hanging in the Airforce headquarters in Trenton, Ontario. I own a painting by Frank E. Beresford, dated sept. 1943 titled In The Oude Kerk Delft and dedicated to Margaret with best wishes. Can anyone tell me something more about this painting?